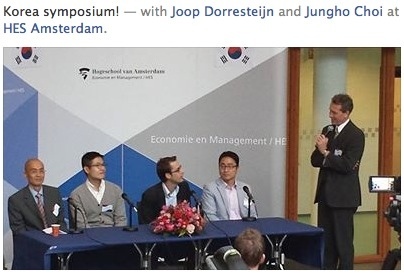 I was invited to be a panelist at the Korea Symposium at the Hogeschool of Amsterdam. Since there were mostly students in the auditorium, curious about doing an intern in South Korea, I’ve elaborated a little bit about my time there, even though it’s almost four years ago already. At the time we were studying in Sweden, we were offered to pick an exchange study in another country. For me that was a chance to experience the culture of my wife, Suna. When we flew to Korea in the spring of 2008, I was excited to start studying at the Korean Development Institute (KDI). This university is known for both business and political studies. I still wonder if KDI expected two blonde Scandinavians or if they were okay with us flying over. After the study, I was fortunate enough to extend my stay with an internship at ING Korea before I had to go back to Sweden. Some students showed some interest in finding a intern or job in the country. When walking around in Seoul a lot of people will inquire if you are a English teacher, as most foreigners are. If you really want to work there, don’t be picky. But frankly, if you have a skill which can work for big companies you have a bigger chance. It also helps to speak the language, although this is less of an issue in international companies. Be aware that you have to work longer hours and have less days off compared to Europe. It’s recommended to study some Korean as there aren’t many company that would hire a non fluent speaker. There is a small chance at an international company but studying a little bit will help you tremendously. There is a school in Amsterdam which has a class every saturday where you can learn, visit their website for more information. I was really sad ending the internship at the time and threw a party for my dear colleagues. Once established, my wife shook hands with a former president of Korea, I met the Dutch minister of foreign affairs at the time. We made it a habit to network and visit business and political events. This also helped me find a job. 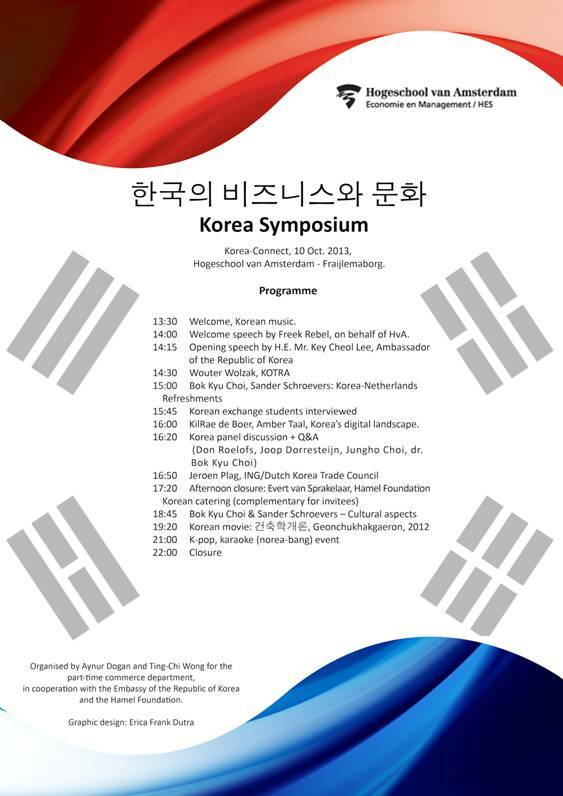 For one, we joined the Dutch business club in Korea and joined them on many occasions. Since there weren’t a lot of Dutch people at the time (likely about 200), it was easy becoming close with most of them. We joined the club to the BA cigarette factory and to the DHL hub. They also organize a Dutch Orange ball event every year. There are many business groups these days, including the Amcham Korea. Almost every Korean has heard about Hamel, have you heard about him? He was the first westerner to write about Korea, back in 17th Century. 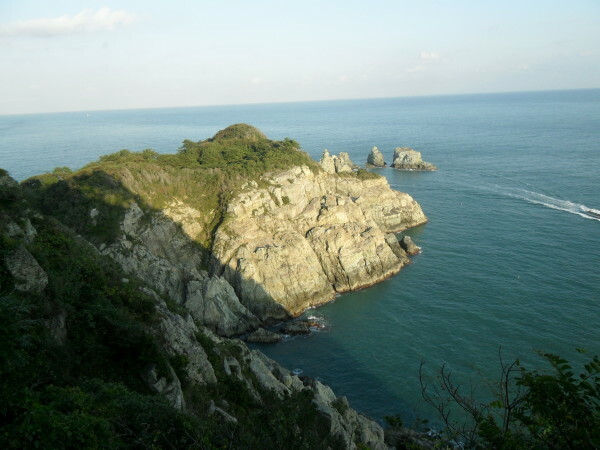 In 1653, he arrived at Jeju island (link follows to my holiday at jeju) along with his crewmates. He was a bookkeeper for the Dutch East India Company. They were actually on their way to Japan. The men were captured by the Koreans and were forbidden to leave the country. After 13 years they managed to escape to Japan and bring back his writings to the Netherlands. Every history book in Korea mentions his name. The first public recognition of Hamel in the Netherlands occurred early in the 20th century, when a local street was named after him. They also made a statue for him. 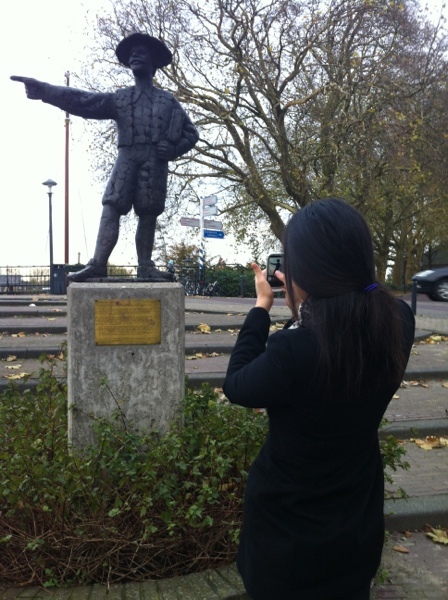 As we passed by Gorinchem yesterday, a visit to his statue and a picture were obligatory. His journal is published as a book under his name. Spent my Saturday learning Korean, I haven’t done anything else since 2011. As you all know my goal is to have conversations with my mother in law. Recently I have been starting to watch some Korean television as classes have become a routine. Make some homework at home and practice speaking with your fellow students in class does seem to help little by little. When that Korean song ‘Gangnam style’ was popular I noticed a lot of new students trying to pickup the language, although that effect seem to have worn off. Recently the teachers allowed me to pass to advanced class, I’m trying to keep up by studying during my Sundays. Last Saturday we were only with three people. 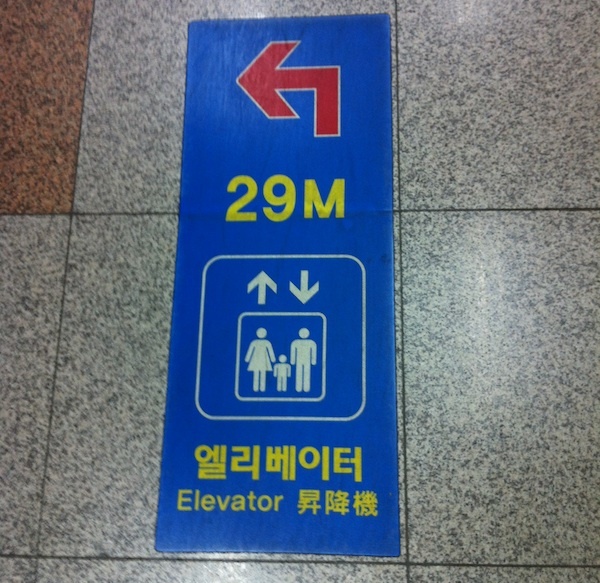 I took the picture above while walking around the Daejeon subway system. To me, this is typical Korean style accuracy. I mean, what would the harm be if they just wrote ’30 meters’? It was my first time camping in Korea. I saw some super de luxe tents and learned that Koreans take their camping very seriously. Could camping have been popularized by some camping-themed TV program in Korea? Besides camping I also visited the Oedo island by boat. 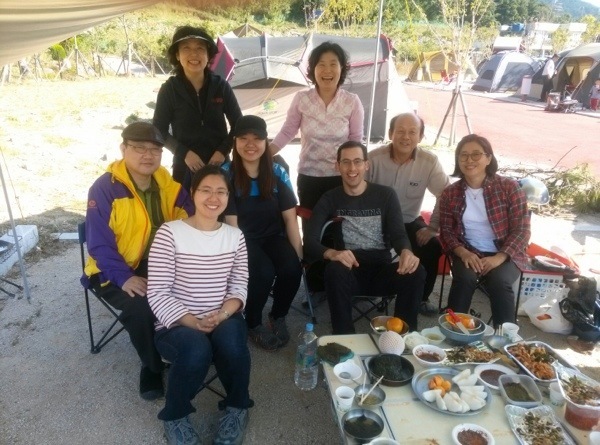 Together with friends of my parents in law, we stayed at the fabulous beach side autocamping in Geojedo, a 400 km drive from Seoul. it was fun putting up our camp, with tents food and a common area to sit. But it took some time and was a lot of work. When everything was done we proudly sat down and ate our lunch a bit tired but very happy. After lunch I took a walk around the camaping and was surprised how Koreans camp. So what’s different? Well, I saw a tent with a TV projector – guess no singalongs there. And many hats. For some reason, the hats featured flashlights. Because? I guess they wanted to check up on their barbeques in the dark. Anyway, the guests didn’t go camping because it was cheap. They bought professional gears and we’re fully packed, even if it was for just one night. Quite different to the ‘as long as there is fire, singalongs and some shuteye’ camping experiences in France and Sweden. Which, also has it’s charm. There is a populair tv programme in Korea called ‘2 days 1 night’ (1박 2일) and it made camping hugely populair in Korea. In the past year, another television show called ‘dad where are you going’ 아빠! 어디가? (Check out this segment of them camping @ youtube) also features a new lifestyle: children camping with dads and preparing food together. You can see this replicated at the autocamping. We made a big hike over the pebblestone beach. Later we climbed the hill and got an amazing view over the cliffs. In the evening we prepared a big barbeque with the three families. There was samyuksal, beers and boardgames. And Korean tales ofcourse. A recommendation. We almost missed it. Actually, we packed up after a nice holiday and started to drive back. Suddenly we noticed a tour operator which featured ferries to the ‘Oedo islands’. My mother in law immediately recalled that they were beautiful and we just had to visit them, so we did. We bought some tickets for about 20 dollars each and waited for our ferry to arrive. Actually, during this waiting time, we enjoyed some beers on the dock while watching the boats, very relaxing! The ferry first takes you to a ‘cracked island’ which is split in half. It’s quite a sight. Our tour operator boat even went inside the crack, which was a bit scary. 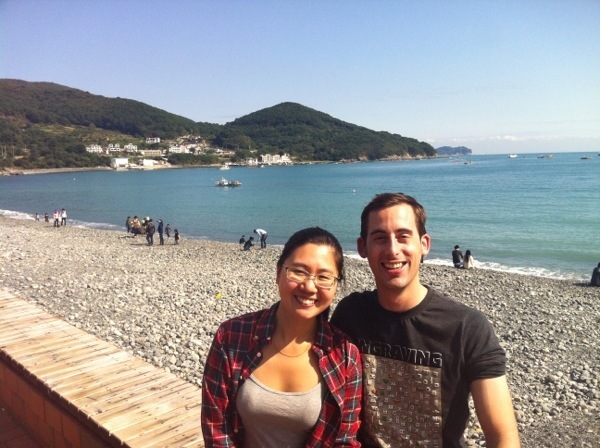 He then took off to the Oedo island (외도). We were told we had about 1,5 hours to explore, which seemed like an awful lot to me. Until I turned a corner and saw the majestic garden. 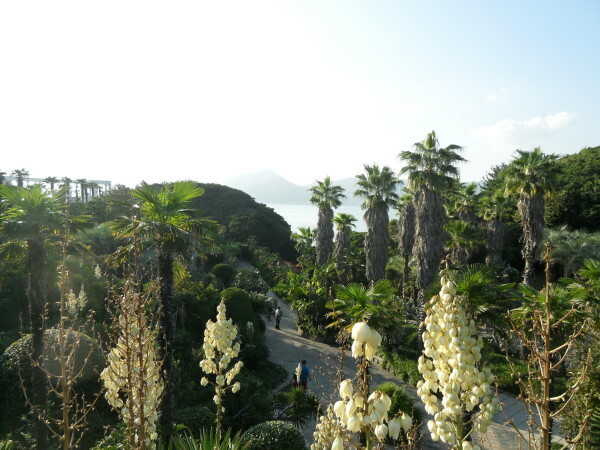 Palm trees, nice seatings, roman pilars and beautiful views on the distant island scenery. I cracked open a drink and enjoyed the view for a while. Then we took a walk through the garden and enjoyed the scene’s and flowers. Before we knew it, we had to get back to the boat and to the land to go back. Certainly a great night and two days! We are in Korea. 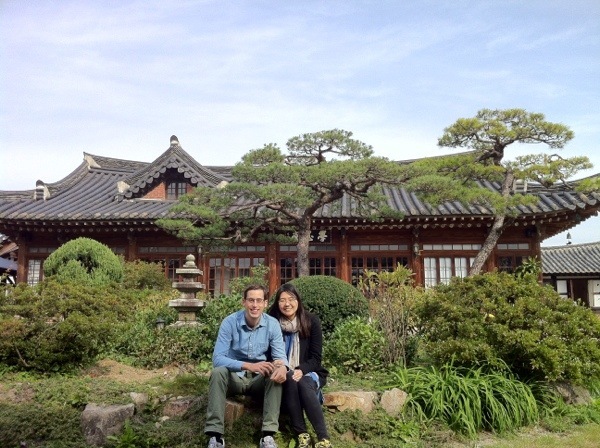 Spent our wedding anniversary in the old town of Jeonju, South Korea. Just look at the picture above, straight from the movies isn’t it? We stayed the night at that very house, in fact the oldest house of the town called Hakindang. Hakindang is a graceful upper class home from the Joseon-era converted to a guest house in Jeonju, built in 1905, has an interesting history and is one of the oldest in the village. 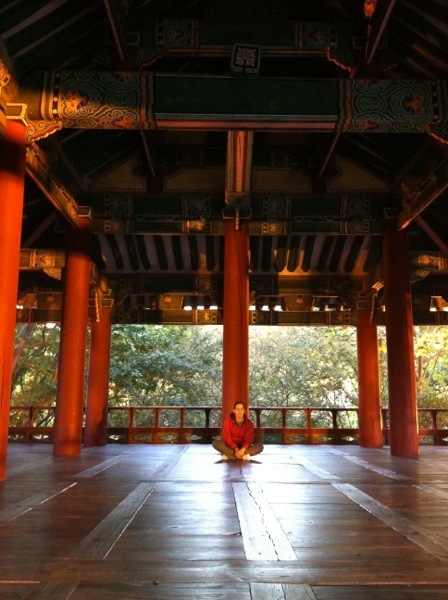 Hakindang is where Baek Nak Jung, a well-known devoted son, once lived. King Gojong granted him a government position out of admiration for his filial piety. late Joseon period. 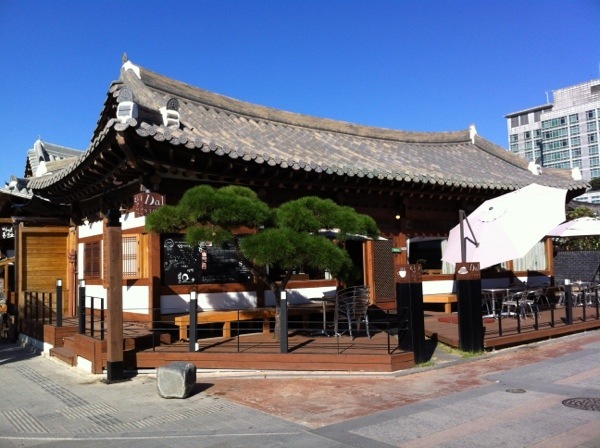 The building is also a typical example of court construction style introduced into the upper class housing after the Joseon Dynasty collapsed. 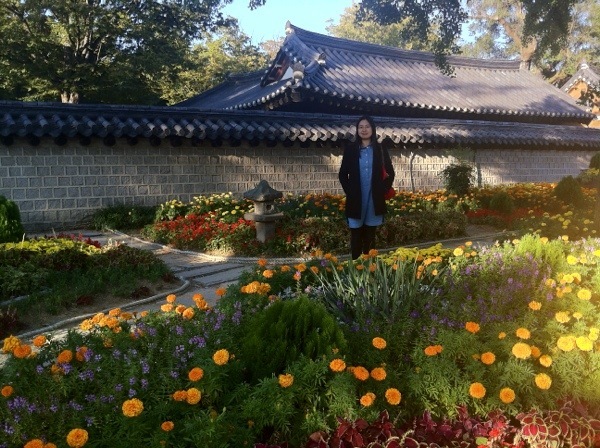 During the day we visited the kyonggijun garden, which was visited by the first king of the Chosun kingdom. A lot of Korean treasures have been destroyed during the occupation but the kyonggijun had safeguarded a lot, including the transcripts of the king’s activities. For dinner we had dokkalbi and we drank moju, both of which were a new experience for me. Then we went back to our house, Hakindang. While the day was warm, the nights get cold here in the Korean fall. The paper walls got me worried for a minute but the room was actually quite warm. We slept traditional style on the heated floor. It’s becoming a tradition to visit a town during anneversary, alrhough this experience was very different from the luxury we enjoyed at that joyful day at sheshan in the P.R.C but certainly a romantic and special experience. developed, it arrived at such standards much much later) He was surprised that I praised the technology in Korea. He expected all of that would be more than common. It wasn’t. So while a developed country might seem more comfortable, and there are lot’s and lot’s of perks, some things just haven’t arrived yet; Traveling back and forth to Korea can feel like a time travel. That feeling is probably due to the little things; Opening doors with keypads, watching TV in the metro, faster trains etc etc. Second recurring theme is that of customer service. Chinese customers are raising the bar for service expectations as competition is fierce. Our feeling in The Netherlands is that customers simply don’t expect high customer service. Life quality here is definitely better than in China. Air quality, food quality and so on. But because the smaller population, it’s not very convenient. Especially public transportation. The subway has only two main lines in this city and the taxi’s are too expensive. Most people living downtown have to buy a car. Talking to them, the recurring theme seemed to be: Transportation. On the food part, friends were divided. Chinese seem to be able to get their foods abroad and thought food quality improved. 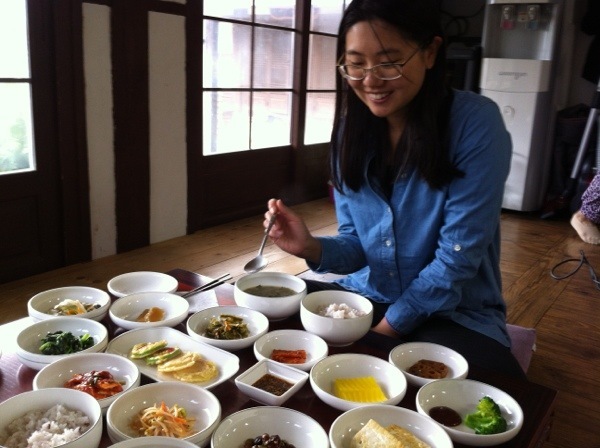 Korean and Taiwanese friends seem to miss their home food (fruit!) a lot. In the end, if you have a choice… one should just be happy where he/she resides I suppose. There are pro’s and con’s at every corner of the earth. the odds of my Dutch colleague to catch that very ball? He took it back to Holland and kept it proudly at his house, not knowing who that player was. The mystery is solved for now but now the next question is, what is the ball worth? Yesterday I went to Amstelveen in the early morning to take the Korean Intermediate 2 exam. For the past few months, I have been studying Korean sentences in the train but I wasn’t sure if it would be enough. At this level, the exam includes speaking, listening, writing and reading. Enough to say that I got a bit nervous and studied a lot in the past week. But good news, already one day after the exam I was told that I passed, so I’m very happy to join the next level: Korean Intermediate level 3! Looking back, I have been studying Korean for three years now, starting in Shanghai. 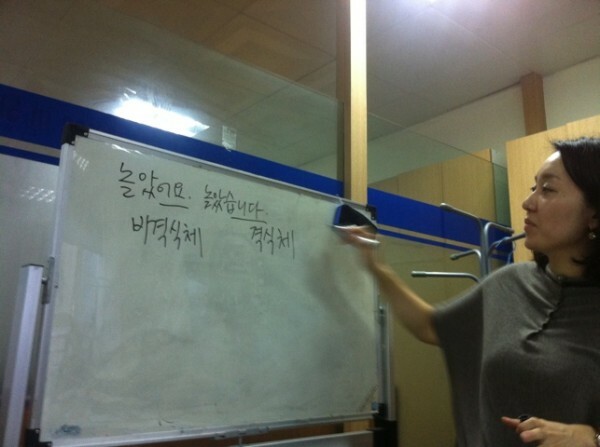 Although, during that time studied both Chinese and Korean, which became to confusing to me. However, during the Korean classes in Shanghai, it was interesting to be the only non-Chinese in the class and learning Korean from a Chinese/Korean workbook. But now in Holland, I can finally learn from an English explained Korean book in Amstelveen. Every day I try to spend some time learning the language. After three years, I now am able to grasp some context from conversations and form very simple sentences in dialogue. An advantage of moving countries is that due to my fellow Dutch students that have simular culture, I get lot’s of good Korean movie-house recommendations. These days I try to watch more movies from Korea; it’s a fun way to learn the language. However, it wouldn’t be possible without a weekly rhythm. Going to class every week really helps. So for me, these Korean language institutes make this all possible. It seems that Korean government has some sort of programme to promote their language and culture. In China they are free to attend, in Holland it’s just 150 euro’s for a semester. Teachers are usually in the country due to working or studying abroad. However, seeing the amount of effort they put in the lessons is amazing. I’m really grateful for the effort of the teachers. In a way, South Korea is pushing soft-power in both culture and language to a lot of countries this way. It would be interesting to think if/how Dutch people could setup a programme to promote language and culture. For example… would a volunteer based Dutch language institute in Shanghai be able to persevere?